This is an amazing folding stair design and would be ideal in a tiny house. It folds flat against a wall, can be open and closed with little effort from above or below, and it even looks amazing. Production of the final product is currently underway, so pricing and technical details have not been made public yet. Learn more about the Compact Hybrid Stairs. Photo by Bcompact. See video below to see the stairs in action. Bcompact Hybrid Stairs from BcompactDesign on Vimeo. This entry was posted in Stairs and tagged Bcompact, folding stair design, Hybrid Stairs. 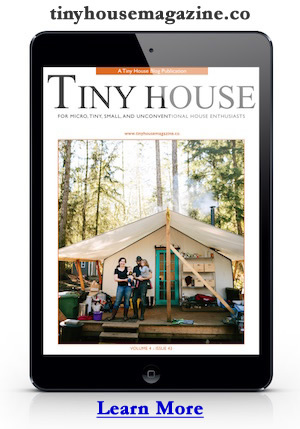 Tiny House Summer Camp – Registration is Open! That staircase is going to stay down all the time. No one, in their right mind, would keep on pushing it up against the wall all the time. And you can’t furnish the area anyway – because the stairs have to come down. So it is a product without any real practical purpose unless you are not able to walk around it like you can on the photo. There’s actually quite a bit of usable space underneath the stairs, just as there is with regular stairs. We have fit dressers and seating under it without any issue. The added benefit is being able to have a dual-functioning space. With a little bit of compact vision a person can use this in a narrow design maybe hang a tv in closed position . Most designs needing a stair such as Tiny Homes a loft ladder takes up a lot of space. I see a lot of future in this ladder. but if you need extra sitting room you have some extra space if needed. This staircase is shown in a rather large hallway/room. I am sure that its practicality would be more apparent were it shown installed in a tiny home, where space is definitely at a premium. I can see this in my mind as being an ideal staircase for a tiny home. It’s not a ladder, but it can stay out of the way just like a ladder, and it would be easy to pull down to use at night and in the morning (assuming that the bedroom is in a loft/upper area). Perfect! It looks like it cannot be folded from above, which is a disadvantage. It also looks like it does not lock into position when folded. That seems like a hazard. If it ever fell open it could be dangerous for people or pets in the way. Nice idea, though. Really elegant. The stairs are actually spring loaded, which helps them stay in place as well as with the motion of opening and closing. They will not open unless you physically pull it down. Even then, the motion is smooth and controlled. You can’t make it “plop” down, even if you tried. Hope that helps!